Lanesboro has your tastes covered! 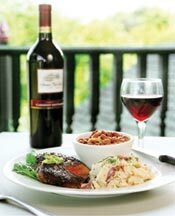 Whether it’s a romantic dinner with wine and candlelight or a down home, local experience, we’ve got your appetites and tastes covered. You can delight in gourmet cuisine on the deck, comfort food, home-cooked local favorites, scrumptious breakfasts, pie & ice cream. Church and social group dinners and bake sales are an added treat from time to time. Relax at the end of your day at a local pub.